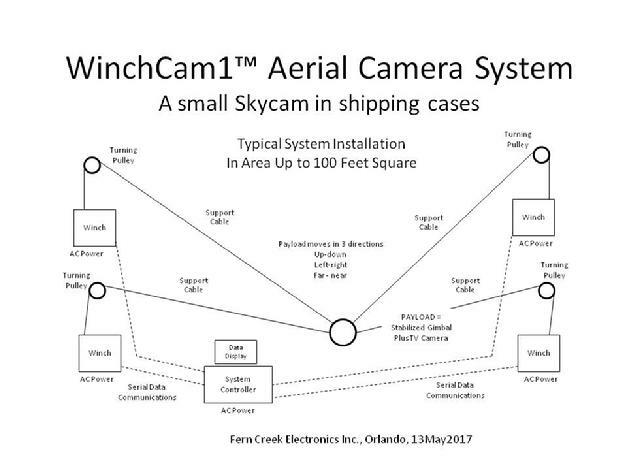 The WinchCam1(TM) Aerial Camera System is a product in development at Fern Creek Electronics Inc. The WinchCam1(TM) is to be a SkyCam-like system for venues much smaller than a football stadium. It is to be cheaper and more easily transportable than is the SkyCam system. WinchCam1 is intended for use in venues with size up to 100 feet square and up to 30 feet high. Such sites might be music festivals, TV productions studios, highschool gymnasiums, small auditoriums, etc. WinchCam1 is a small SkyCam system. Wikipedia says that a SkyCam is a computer-controlled, stabilized, cable-suspended camera system. The system is maneuvered through three dimensions in the open space over a playing area of a stadium or arena by computer-controlled cable-drive system. The FCE WinchCam1 equipment consists of four servo-controlled winches, four cables, four turning pulleys, a gimbal& camera payload structure, and a central System Controller computer. The WinchCam1 prodcuct is in development stage. In February, 2018, FCE has conducted system testing of WinchCam1(tm) in a 50-foot-square hangar owned by Jordy Klein of Jordan Klein Film & Video. Several videos of the operation in the hangar are available on Vimeo. Further system testing is planned - there are still some small issues with jiggling during payload movements.